“This enlightened and detailed book…spares no-one. This book….should be made compulsory reading before one can join the Institute of Road Safety Officers, the judiciary, become a motoring correspondent or even drive a car. If it fails at all it does so only because it is too comprehensive to be read by sceptical road safety professionals and attitude shapers. Highly recommended.” Colin Graham, Cycletouring and Campaigning, April/May 1993. “…makes sobering reading for those seriously concerned about road safety….A challenging read..” ‘The Hawk’, Commercial Motor 6 – 12 May 1993. “This is a book which does for road safety what Galileo did for astronomy. For pedestrians concerned about the literally deadly threat they face from motor vehicles, it is no exaggeration to say this is probably the most important book ever published on the subject….a devastating book…. 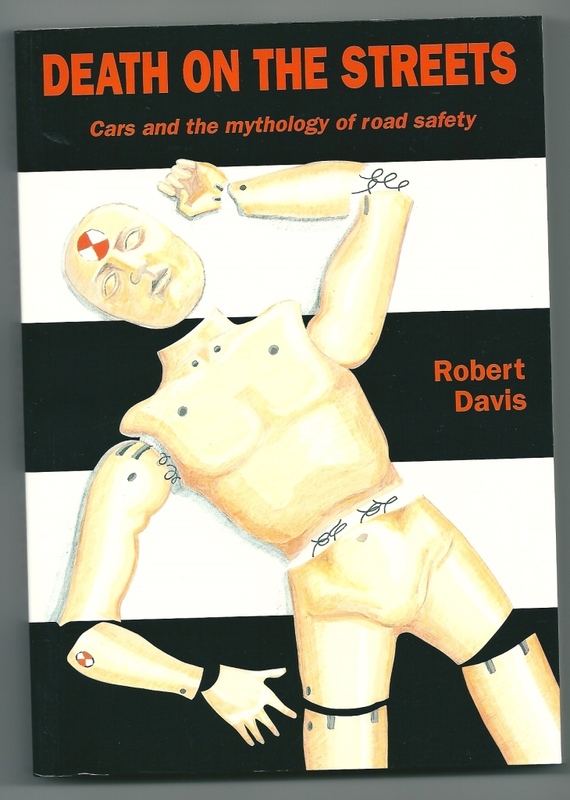 Davis seems to have read every book and paper ever published on transport and road safety.. he writes in a lucid but scholarly manner, with all the facts at his fingertips….Death on the Streets is, quite simply brilliant. it amounts to three-hundred pages of stunning argument and authoritative analysis that takes the road safety industry and our car-dominated transport status quo apart. If readers of WALK only ever buy one book on transport, this should be it“. Ronald Binns, WALK (Pedestrians Association), Summer 1993. “..I would recommend this book to any road safety practitioner, especially to those who believe in engineering as the great cure-all. It is a book which should also be made available to every teacher who covers road safety in his or her classroom.” Richard Doherty, Care on the Road (RoSPA) August 1993. “This is an important book…..I remain both scientifically impressed by the sheer weight of evidence and emotionally swayed by the contrast between adjacent photographs showing children playing in the streets 30 years ago and the barricaded truck routes of today.” Richard Mayou, The Lancet Vol 342, July 24 1993, p.226. 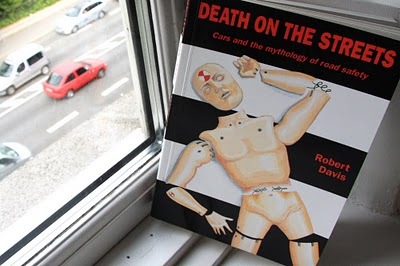 ‘Death on the Streets; Cars and the mythology of road safety’, by Robert Davis, was published by Leading Edge Press. ISBN 0-948135-46-8. (1993) at £11.99. As it is now out of print and there are only a few rare copies left, I am charging £25 (inc. p&p in the UK ) for private copies (signed if wished). If you wish to take up this offer, e-mail me at chairrdrf@aol.com with your contact details. To download the whole book, click on the title below the image. Note that this file is about 40 megabytes, so you’ll need a broadband or better connection (or hours of patience). It’s great to see this available. Still controversial, and essential reading for anyone who wonders why the world works the way it does. You’ll get abut 10x more downloads if you make the ‘Now Downloadable’ headline clickable. Thanks for yur comments Romilly. We are still experimenting with ways to downlaod. The link to download the book seems missing. Please could you fix it? Ed, I have just checked and it is working. Click the title below the image of the book on the page you get to when you have used the link on the http://www.rdrf.org.uk home page. let us know if it works. You may have to check browser and other usual stuff. But I just checked it and it is working. Hi. There is a problem with the way Google Chrome (Version 30.0.1599.66 m) renders the page, meaning that the link cannot be seen. It works OK with Mozilla Firefox. With Internet Explorer 9, the page threw an error and the browser reverted to ‘compatibility mode’ but then still managed to display the link. I would suggest you double check the way the page renders on Google Chrome/IE9, as these are two of the most popular browsers. Cheers. Ed. Ed’s comment was: ” Hi. There is a problem with the way Google Chrome (Version 30.0.1599.66 m) renders the page, meaning that the link cannot be seen. It works OK with Mozilla Firefox. With Internet Explorer 9, the page threw an error and the browser reverted to ‘compatibility mode’ but then still managed to display the link.